Joining the powers of the left and right sides of the brain is central to the practice of landscape architecture, while tapping into our creativity and brain muscle allows our profession to give shape to previously unexplored opportunities. The Cal Poly Pomona students have been applying their minds to the science and art of our profession: see their observations on the process below. 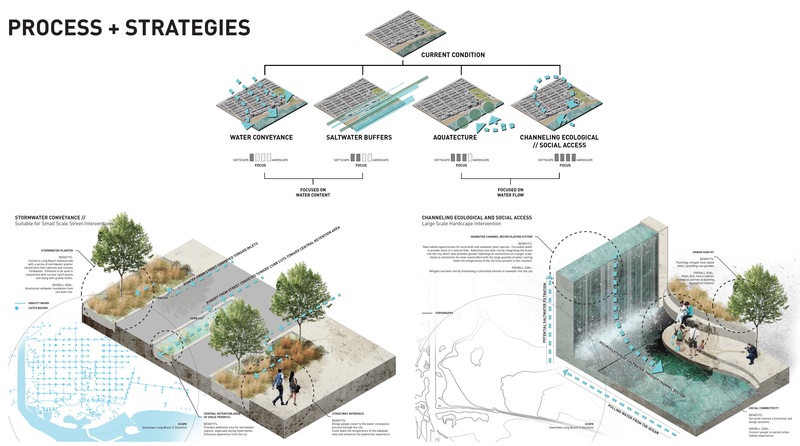 Amphibious Neighborhood Team: Amanda F., Iliana V., Elise A., Andres R. / Amphibious neighborhood strategies by Amanda F.
I believe that the list of strategies to address these [adaptations to sea level rise] must be equally extensive. As a team, we began to delve into a multitude of strategies that involve softscape, hardscape, and every hybrid strategy in between. Ultimately, these all have potential to be viable solutions. And, I think a good way to start is to look at the water not as a force to be stopped, but as a dynamic entity to be worked with. During the mid-review at the AHBE office last week, I was a little bit nervous to speak in front of professional landscape architects in the beginning. But as I received feedback and comments from them, I was relieved to find out that they understood what we were going through, and that they wanted to help improve the project. Also, as we were receiving feedback from Juliette, a specialist from U.S. Geological Survey, I learned once more how significant the issue of sea level rise was to today’s society. What I loved about this mid review was that I could be a part of an effort to mitigate a problem that many people don’t take seriously. It was also exciting to think of possible solutions for an issue that is going to be dealt in a global scale for the first time. Details from Amphibious neighborhood strategies by Amanda F.